China Pakistan Economic Corridor was hastened and its scope was expanded by opening its doors to industrial cooperation, agriculture and socio-economic development. 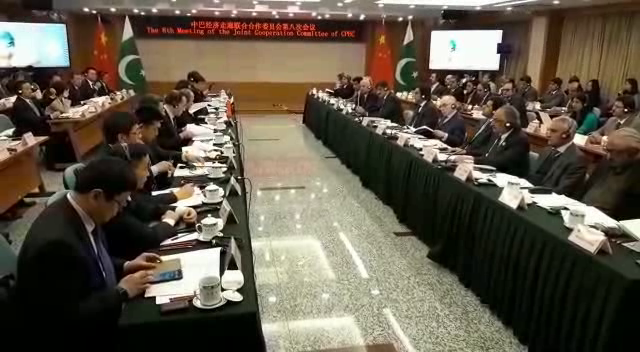 Minister for Planning, Development & Reform Makhdum Khusro Bakhtyar has said that 8th Joint Cooperation Committee (JCC) has set new targets for Pak-China cooperation, leading CPEC towards becoming a true economic corridor with multiple doors. He expressed these views here on Friday after conclusion of the 8th JCC proceedings. Minister said that as per the vision of leadership, work on China Pakistan Economic Corridor was hastened and its scope was expanded by opening its doors to industrial cooperation, agriculture and socio-economic development. Minister said Pakistan and China have agreed to further strengthen the JCC mechanism through increased frequency of exchanges. "Signing of MOU on Industrial Cooperation would steer Pakistan into a new era of industrialization and to expedite development of special economic zones by relocation Chinese investments" Minister remarked. Cooperation in diverse industries such as textiles, petrochemicals, iron and steel, mines and minerals, and automobile is new target of CPEC, he added. Mr. Bakhtyar said that Pak-China cooperation in agriculture sector would focus on attracting investment in food production, processing, logistics, marketing and exports in joint ventures (B2B) with Pakistani companies. The cooperation would transform Pakistan's agriculture economy, benefiting from Chinese technologies, experiences and supply chains that would help Pakistan to significantly grow its exports, he maintained. The first meeting of the JWG on Agriculture is planned to be held in the first quarter of 2019. Minister PD&R further announced that newly established Joint Working Group on Socio-economic Development has devised an action plan that provide guideline for future cooperation in education, agriculture, poverty alleviation, skill development, healthcare, water supply and vocational training projects Development initiatives in these sectors would be launched in a short span of time to uplift less developed areas particularly Balochistan, as well as Southern Pubjab, Southern KP, Northern Sindh and Gilgit Baltistan (GB), he underlined. He intimated that in the next phase of CPEC, two sides also agreed to cooperate in maritime sector, port development and automobile sector. Makhdum Khusro Bakhtyar said that future focus of energy sector will remain on power projects based on local resources and transmission lines projects, following an integrated energy plan. He vowed to promote development of hydel projects in Jehlum Cascade and GB. Government prioritizes connectivity aligned with CPEC as well as Belt and Road Vision, Minister emphasized and said that government has prioritized development of road projects in GB, KP, Balochistan and Southern Punjab. 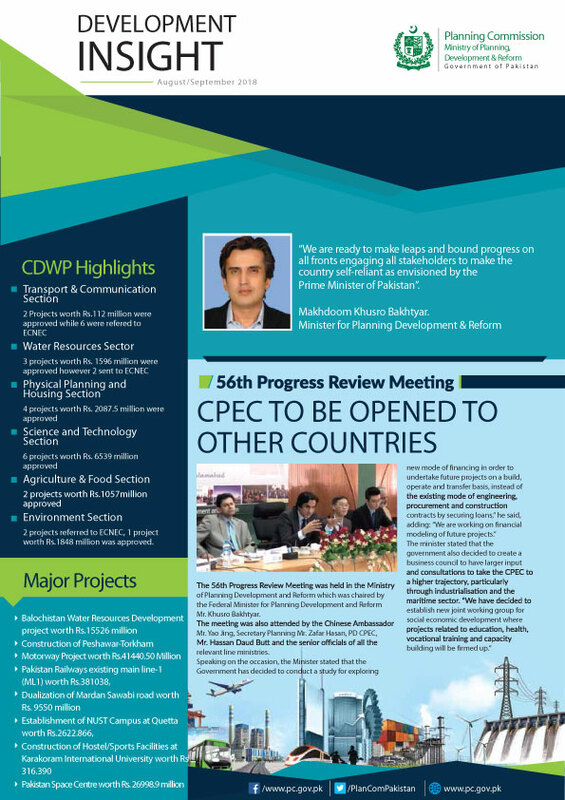 Pakistan would explore innovative financial model including built operate and transfer to finance mega connectivity projects.